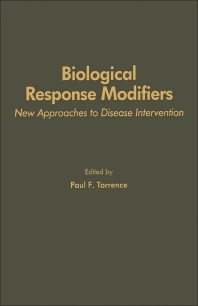 Biological Response Modifiers: New Approaches to Disease Intervention focuses on biological response modifiers (BRMs) and the ways they provide novel approaches to disease control. It examines how BRMs act through an organism's own biological response mechanisms and how their mechanisms of action can be utilized to develop new modalities of chemotherapy. Organized into 15 chapters, this volume begins with an overview of specific agents and approaches to biological therapy, the basic concepts of immunity, and BRM screening. It then discusses interferons and their immunoregulatory functions; mechanism of interferon action; how nucleic acids and polynucleotides regulate the immune system; clinical applications of thymosins and other thymic hormones; the antibacterial and antineoplastic properties of tuftsin; and production and characterization of tumor necrosis factor. The reader is also introduced to detection and activity of colony-stimulating factor; the role of neuroendocrine hormones in the immune system; chalones and other endogenous inhibitors of cell proliferation; biochemistry of lymphotoxins; muramyl peptides as immunopharmacological response modifiers; biological activities of transfer factor in leukocyte dialysates; and requirements for activation and growth of human lymphocytes. This book is a valuable resource for immunologists, clinicians, biochemists, and organic/medicinal chemists.